When Mary Powell entered the meat goat industry in 2012, she had no idea that in 2016, she would be using those goats for weed, brush & fire control. 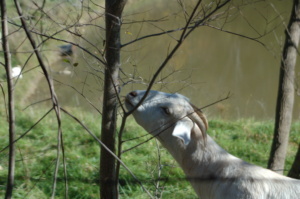 However, the landlord, with whom she was in the meat goat business with, refused to update all the fences on the property, which forced Mary to come home every day from a 10-12 hour work day, to turning the goats out on pasture, for 3-4 hours an evening. Getting tired of babysitting goats in this manner; pushed her into investigating the goat grazing industry. After six months of research, phone calls and working out the numbers, Mary presented her banker with a business plan that allowed her to obtain a small business loan, for start up costs. In March of 2016, Barnyard Weed Warriors became a reality and the first season was a great success. Moving into the future, the Barnyard Weed Warriors are starting to work on special projects that include working on sericia lespedeza, which is a very noxious weed in Kansas. Three test sites are set to be worked in the 2018 season with more, hopefully to be scheduled. We are also working with the NRCS (Natural Resources Conservation Service) on a special prairie improvement project. We will update information on these projects as they become available.